As a home school mom, I feel the MOST important class or area of study I need my children to 'get' is that of their faith. Knowing why they believe in Christianity, why they are looking through the world with a Biblical worldview, and how to hold on to that in the worlds view, is of utmost importance. Not only is it important to utilize the devotions for young kids at an early age, I find it even more so to keep them in the Word as teens. Even as home schooled teens, their faith will be tested, often time within their own church body and with their friends. 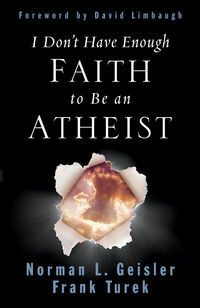 My 17 year old was thrilled to read the Title of this book by Norman L. Giesler and Frank Turek, "I Don't Have Enough FAITH to Be an Atheist". From previous teaching, and movies we have been watching, he says "That is so true Mom, I just don't understand how people can't believe in a creator". 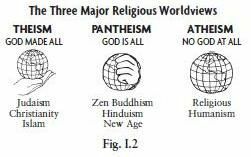 The book starts right off with defining the 3 major worldviews. Theism, Pantheism, and Atheism and the religious groups that adhere to them. The book then goes on to outline the "Twelve Points That Show Christianity is true". Beginning at the very start with a person who doesn't even believe in truth. You can't begin to share God and his Truth with someone who doesn't even believe in truth. Providing evidence for Christianity allows us to know why we believe what we do and be able to give a reason for our faith Biblically. Each chapter gives an overview of what it will cover. This is deep reading, I would say definitely for an older teen or adult. I can't see my 13 year old being able to stick with this. 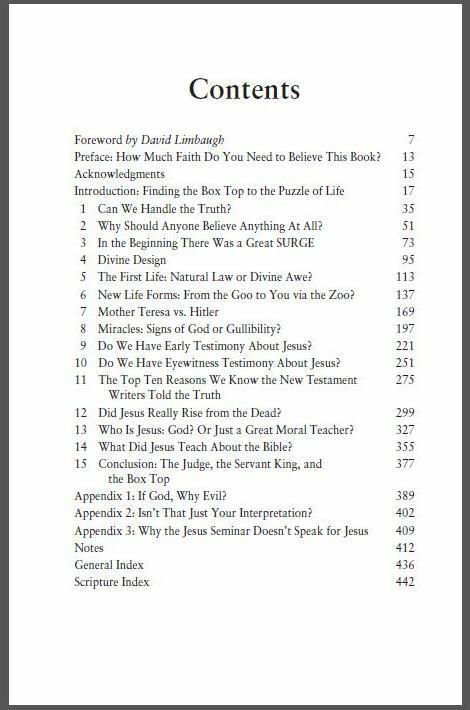 My 15 and 17 are at the age where they are beginning to be out in the world more and realizing that they need a reason for their faith when they are ac-ousted.You can see below the detailed contents of this over 350 paged book. (fantastic appendix and notes too by the way). The book in of itself is extremely informational, very detailed, and a reliable, evidence proving title. Handing a book to my child, and asking them to read it and tell me about it is too subjective though. They will be able to tell me bits and pieces of it, but they will miss out on key items if they are not directed. Apologia has the perfect workbook to make this Non-fiction book on Apologetics into a Curriculum for my home schooler or a youth group. 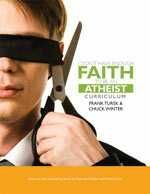 "I Don't Have Enough Faith to be an Atheist Curriculum" by Frank Turek and Chuck Winter. I struggled a little bit with how to use this course in my school. I wanted to incorporate it into a high school credit for the boys, rather than just a devotional set up. I felt it was too intense and they would give up if they weren't getting rewarded with points for school for their time. We are talking teenage boys here, even with the excitement of the title of the book! The workbook recommendation is to take 2-3 weeks for each chapter or reading assignment and workbook. That would stretch it out to a 9 month long learning. That works well if you want to incorporate it into the whole school year, but I personally felt like that was dragging it out too long. I rather incorporate it into a semester long course on an elective titled simply Apologetics. I think there is enough course work, and papers to be written that could merit a half credit class. Both my 15 and 17 year old are participating in my 'class'. Sharing the reading book has been a challenge at times as they both have a deadline for reading it. I can see the benefit of each child in the class or small group bible study having their own copy of the reading book! We chose to answer the questions together in the workbook, simply because I only had one copy of the workbook at the time. It would be necessary to have a workbook for each student you are teaching. The workbook is $33 and you can get that at Apologia (just click on the workbook title above for the direct link). The reading Text is $16 available as well. Under $50 for a semester class on Apologetics really is reasonable for the depth that this study gives. Having the interaction of discussing it with my kids is helpful to myself as well. I have been a Christian since college, but there are still great things for me to learn on how to defend my faith and to talk to others about it. This benefits not only the student but the teacher as well! I loved how the workbook introduced us to profiles of important people or topics that help us understand the material better. Both men of faith, and those who claimed atheism or agnostic. It was helpful to learn some of the history of how these men believed what they did, and where it led them. Immanuel Kant whose ideas led to the rise of agnosticism, I had never even known about him prior to this workbook. Justin who was martyred for his faith as he refused to deny Christ in the second century. These personal bio's were helpful to me to put a face and name with some of the people who are be involved in the 3 world views we have today. There are 3 or 4 writing assignments for each chapter, and I am having the boys choose just 1. These are fairly indepth assignments that I am asking my boys to invest a week into reading about, working on and giving me a finished product. They will take some thought, some research and some skills to meet the goal. Between the reading assignment, the workbook questions and the writing assignment I think in the course of the semester my boys will have a great grasp on what they believe and will be able to share it with others in an exemplary fashion. Apologia is a fantastic resource for a variety of homeshool and biblical studies. Be sure to check them out for your curriculum needs. As a TOS reviewer I received the these products from Apologia free of charge to better facilitate my review. Opinions expressed here are solely my own.